Her house was overrun with the needy during a plague and famine in 1629 - 1630. To house them all Virginia rented the vacant convent of Monte Calvario and moved her charges there in 1631. Due to crowding, extra housing was built in 1634, Virginia was soon caring for 300 patients, and in 1635 she received official government recognition for her hospital. Virginia worked closely with the young women in her houses, teaching them religion and ways to earn a living. Sadly, though the Institute was a success, healing the sick, educating children, training adults, and helping the dissolute return to productive lives, assistance, personal and financial, began to decline. Without the chance to work with Virginia, many of the middle and upper class did not participate, fearing the poor and rough residents. Though her health was failing, Virginia returned to active administrative duties. She worked for general spiritual development throughout the region, working for the choice of the Blessed Virgin Mary as patron of the republic of Genoa in 1637, for the institution of the Forty Hours' Devotion in 1642, and the revival of home missions in 1643. She acted as peacemaker between noble houses, and aided in the reconciliation of Church and Republic authorities in 1647, ending a dispute caused by the government abandoning support of the Institute. Virginia continued working up to the end of her days, and in later years received the gifts of visions and interior locutions. One of nine children born to the industrialist Clement di Rosa and Countess Camilla Albani and Clement di Rosa. Her father owned a large spinning mill, and Mary grew up in a happy and pious family. Educated by Visitandine nuns. Mary's mother died when the girl was seventeen, and she left school to help manage her father's estate. Her heart set on a religious life, she turned down many suitors. She worked with young girls in her community, those who worked in her father's mills, and the sick in local hospital, including endless work during the cholera epidemic of 1836. Founded a home dedicated to the spiritual needs of young girls, and a school for deaf children. In 1840 she became the superior of the Handmaids of Charity, nuns who cared for the sick, and she took the name Mary Crucifixa. The community received their bishop's approval in 1843, papal approval in 1850, and Mary led them until her death. Happily married to Angelo Strata from age seventeen to twenty-six. Mother of six. Widowed in 1587 at age 25, Victoria wanted to marry again because of her children, but a vision of the Virgin Mary convinced her to begin a single life of motherhood, chastity, prayer, and charity to the poor. When her children were grown, she and ten like-minded friends took vows of religion in 1605, and used a grant from a rich friend to found their first house. The group formed the beginnings of the Blue Annonciades or Blue Nuns which soon had houses scattered through Italy and France. Victoria served the rest of her life as the congregation's first superior. Born to a wealthy Lutheran family. Studied briefly in Paris, France as a teenager, but fled during the French Revolution. While studying in Verona, Italy his contact with priests and lay Catholics led to his conversion to Catholicism; his parents disowned him. Priest, with a special ministry to the sick and reformed sinners. Member of the Evangelical Brotherhood of priests and laity. Studied civil and canon law in Pavia, Italy. Taught languages. With Blessed Luigia Poloni, he co-founded the teaching order Institute of the Sisters of Mercy. Benedictine monk. Spiritual student of Blessed Falco of Cava. Chosen seventh abbot of the Holy Trinity monastery in Cava dei Tirreni, Campania, Italy on 9 July 1146; received a blessing for this office from Pope Eugene III, and served for 24 years. He expanded and rebuilt elements of the monastery, and aided in the reform and expansion of the San Lorenzo monastery in Panisperna, Italy. Noted for his loyalty to the Pope during a period of strife, and as a peacemaker between Pope Adrian IV and King Guglielmo il Malo of Sicily. Son of a Byzantine army officer who died in battle. After his mother's death sometime later, he and his brother Basil became monks at the monastery on Mount Olympus, Greece. Paul later left to become a hermit on Mount Latros, Bithynia, Asia Minor. 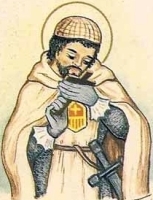 His reputation for holiness spread, and he began to attract followers and students, so many that he organized them into a community on Latros. After twelve years as their leader, Paul left to live as a hermit in a cave on the island of Samos. His reputation, however, followed him, and the cycle repeated - more students gathered, and more communities were formed. Late in life Paul returned to Latros where he spent in remaining years in prayer and solitude. Studied at the Salesian college in La Coruña, Spain. Member of the Salesians, taking his vows on 10 October 1930. Studied in Italy and taught in Madrid. When his school was shut down in the anti-Catholic persecutions of the Spanish Civil War, he worked in a hospital until captured by the anti-Christian forces. Martyr. Born to the Frankish nobility. Monk at the monastery of Saint Martin, Val de Onsera, France. Priest. Captured by Saracen raiders, and taken to the area of modern Spain. He escaped, and became a hermit in the Pyrenees Mountains near Huesca, Aragon. The Ermita de San Úrbez in Huesca is named after him. Member of the Salesians, taking his vows on 25 July 1920. Marytred in the anti-Catholic persecutions of the Spanish Civil War. Fourth century Christian maiden kidnapped and enslaved by the pagan Iberi around the Caspian and Black Sea; her real name is lost to us, and she was called Christiana because she refused to give up her faith. 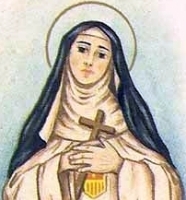 Having performed miracles by praying, Christiana converted members of the Iberi royal family who sent to Emperor Constantine for priests and missionaries to convert their people. Nephew of Saint Euspicius. Co-founder and first abbot of the Abbey of Micy, France on land donated by King Clovis. Legend says that at one point he prayed a dragon into submission, and then spent his later years as hermit in the dragon's former cave. Bishop of Abbenza in North Africa. Arian Vandals demanded that he turn over his sacred vessels to them; he refused and so was exiled with a public order that no one was permitted to give him shelter. Martyr. Pious youth. Dominican tertiary. Devoted to the sick and poor, spending whole nights praying over the sick in her care. Miraculous healings reported. Drove away demons by making the Sign of the Cross. Born to the nobility. Studied at Gorze Abbey. Benedictine monk. Bishop of Verdun, France in 984, and bishop of Metz, 984 later that same year. Founded several Cluniac monasteries in his diocese, and helped in the revitalization of Gorze. Mercedarian tertiary who lived in the monastery of Holy Mary in Granada, Spain. Miracle worker. Abbot of Bangor Abbey, Ireland. One of the leaders of the great monastic program of evangelization and protection of the arts in Ireland. Soldier, knight and officer. Mercedarian friar at the convent of San Matteo, Jativa, Spain. Considered the most learned woman of her day. Fought against heresies. King of Essex, England. He gave up the crown to become a monk in Rome, Italy. Camaldolese nun at Arezzo, Italy. A group of Christians martyred together for their faith in North Africa. The only details about them that survive are their names - Caelian, Candidus, Faustinus, Fortunatus, Januarius, Lucius and Mark. A group of 22 Christians martyred together in the persecutions of Valerian. The only details we have are five of their names - Antonius, Irenaeus, Saturnin, Theodorus and Victor.